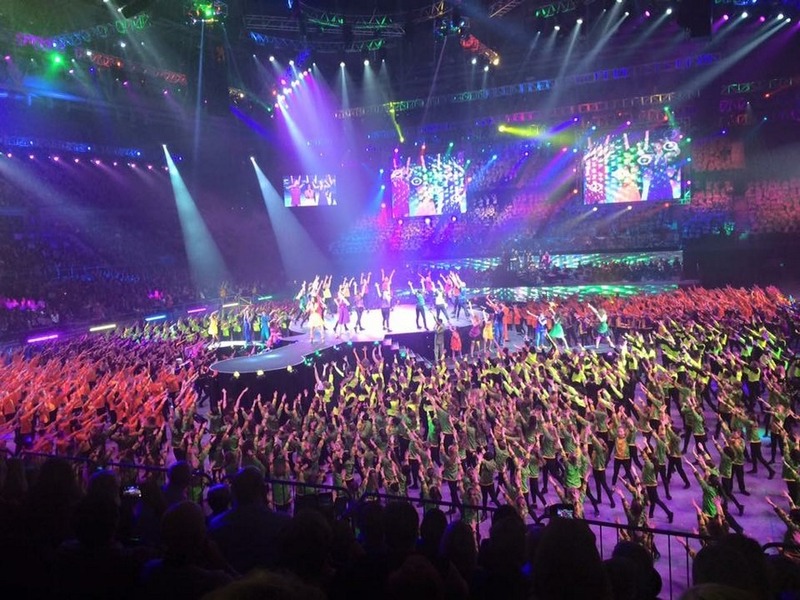 Thanks to Shelley Ware for this week’s post on Kew Primary’s part in the Victorian State Schools Spectacular. 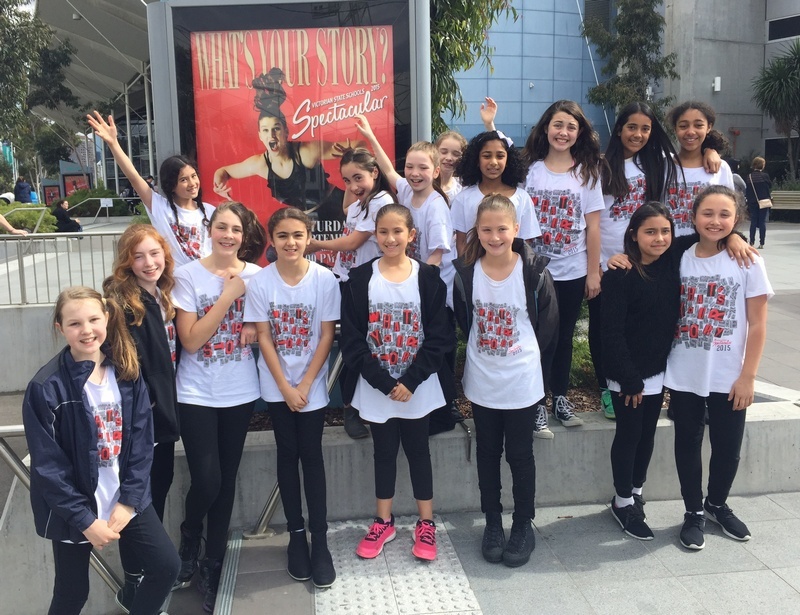 It was so exciting for Kew PS students from year 5 and 6 to be involved in the 20th anniversary State Schools Spectacular. The theme, What’s Your Story?, paid tribute to the wonder of story telling and the power of the imagination. 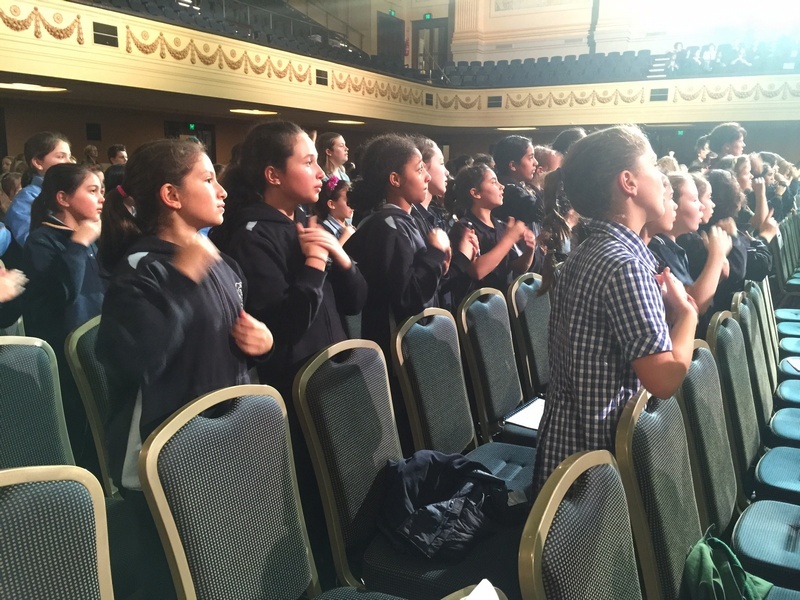 We had 17 amazing students perform in the Mass Choir (from year 5 – Zoe, Adele, Maddison, Lola, Tully and Ruvina, and from year 6 – Sasha, Monique, Bridget, Isabella, Samantha, Talei, Rafaella, Maia, Jessie, India and Chenti). They were all brilliant, learning their words to the many songs we performed and also later the choreography to each song. They all showed commitment and passion beyond their years. 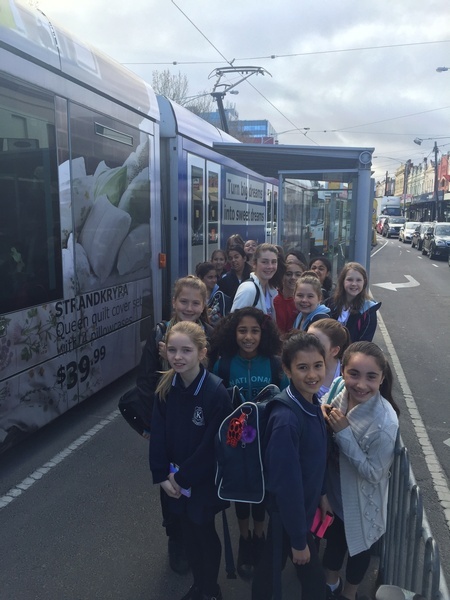 We caught the tram to all of the practices which included two full days at the Melbourne Town Hall and then, the week of the performance, two days at Hisense arena. They worked so hard and it was a pleasure to take them as a group and watch them grow as performers. 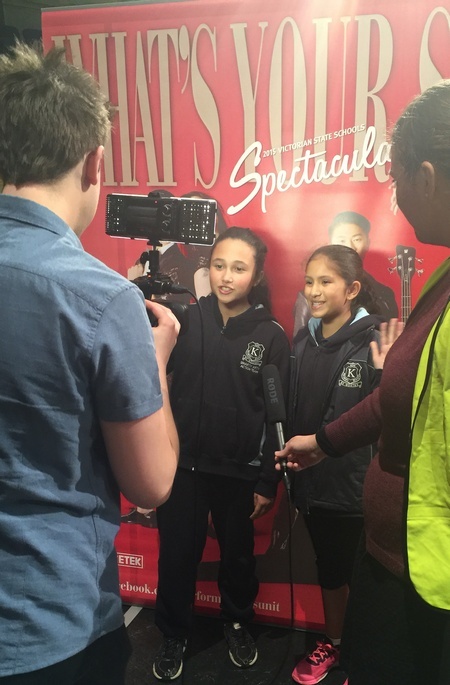 It was wonderful for the students to see the making of such a huge production, from watching students learning how to use a camera to film the show through to other children playing musical instruments in the orchestra. 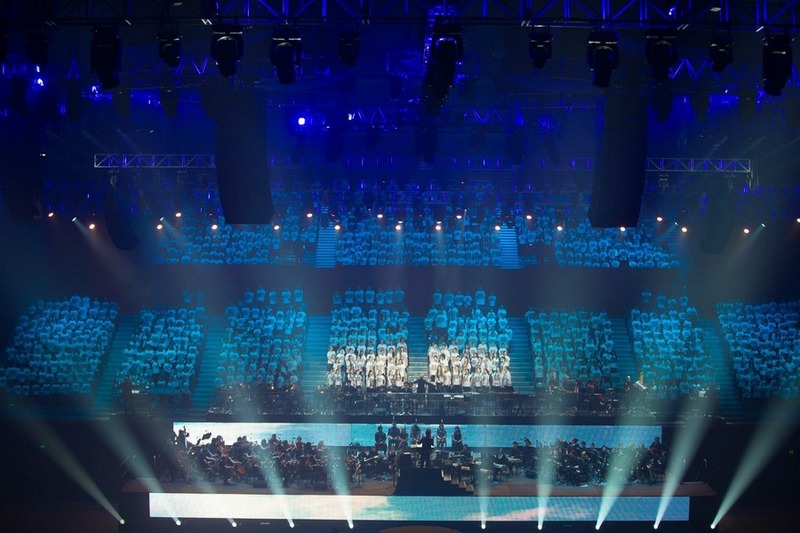 The children were exposed to the many layers of organisation and commitment required to put together such a show. An invaluable experience and they all learnt that anything is possible with hard work! We had an amazing répétiteur in Rainer Pollard who helped us very step of the way. He was energetic and passionate about the mass choir, whose contribution lifted the songs of the soloists and made show complete. They got to sing a new Welcome to Country song called Wominjeka Wurundjeri which was arranged by the very famous Chong Lim and co-written with Aunty Joy. It was certainly a special moment to watch young nine-year-old Lillie Walker’s stunning performance. They also sang the breathtakingly beautiful Songs of Sanctuary: In Caelum Fero and then had a change of pace with Happy and the finale song, Best Days. “The feeling of what you can achieve if you work hard was inspiring. 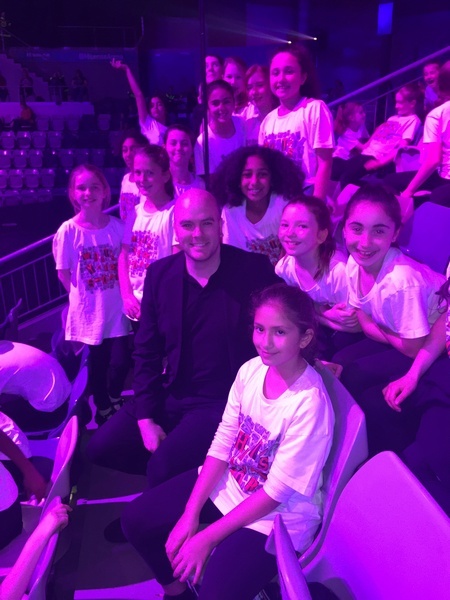 I was very proud of everyone from Kew PS and being a part of the mass choir supporting the main acts was amazing,” said Zoe. Thanks to Ali, Gordana and James for helping us along the way. Also a huge thanks to the parents who came and watch the children perform, they loved it. Your support was invaluable. You will be able to watch the Victorian State School Spectacular on Channel 7 on Saturday 7th December at 7pm – tune in, you’ll love it! This entry was posted in Events, Students and tagged dance, extra-curricular, Grade 5, Grade 6, performing arts by Kate W. Bookmark the permalink.